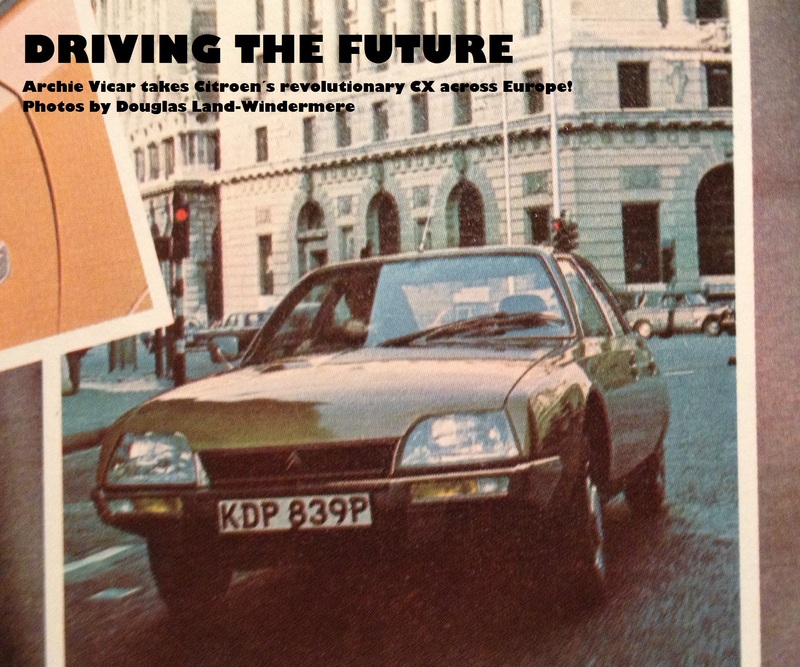 Continuing our celebrations of the Citroen CX’s 40th anniversary we present what resembles a period review by Archie Vicar. What did the great man think of the car on a drive from Paris to the West German border with East Germany in 1974? 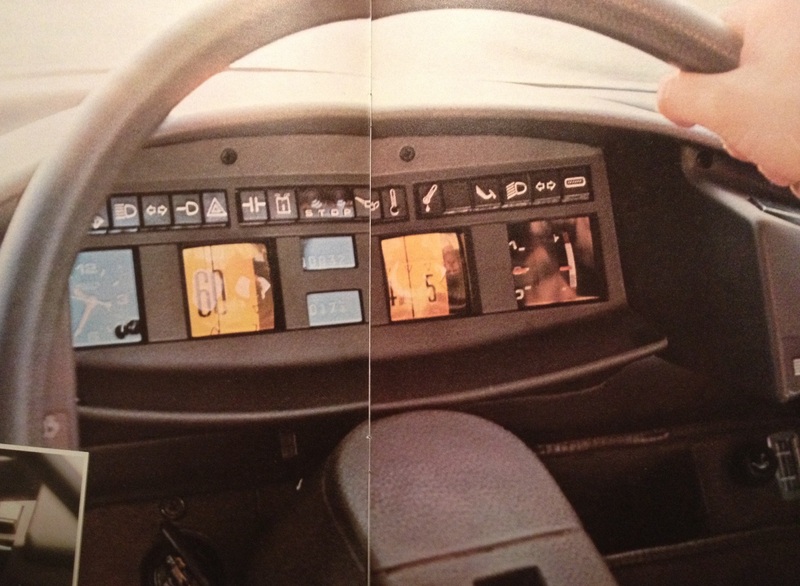 Indicative of the Citroen CX’s innovative character, the oil level can be checked inside the car thanks to a pneumatic indicator on the remarkably novel dashboard. The CX resembles a futuristic show car but is in fact on sale soon. The body shell joins to the underframe by means of 16 flexible rubber mountings. The steering strongly self-centres so that one only has to apply force when changing direction. The list of exceedingly interesting advances could fill this whole article but these, I earnestly hope, show readers what a very different beast the CX is from the ordinary mass of saloon cars offered in today’s increasingly competitive market. 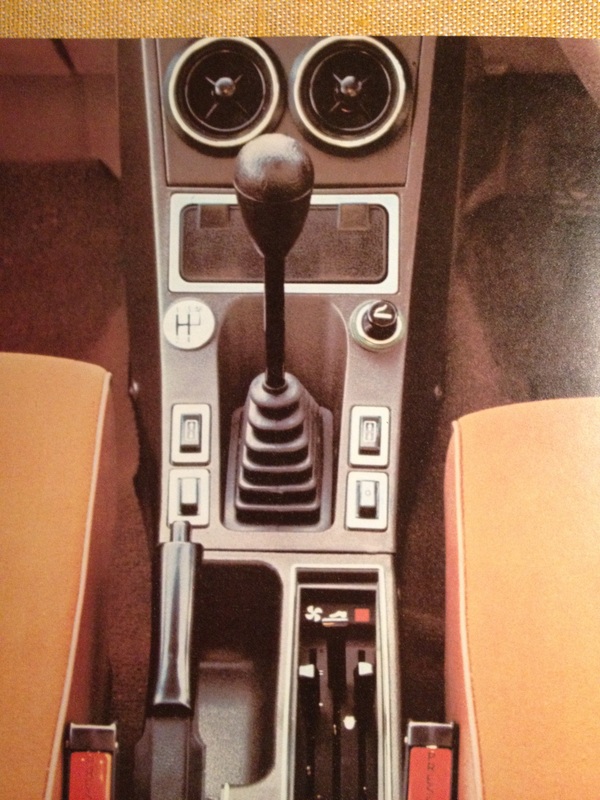 Excellent layout and a big ashtray: the 1974 Citroen CX centre console. Citroen offer three levels of specification: the CX 2000, the CX 2200 Super and the CX 2200 Pallas. For this test we were given a CX 2200 Super to review. The Super has a 2175 cc four-cylinder engine which nestles transversely in the carefully laid-out engine bay. The engine is water cooled and inclined 30 degrees forward to aid the aerodynamic lines that politely declare Citroen’s unique approach to motor car construction. The exhaust has a duel manifold and the clutch is of the diaphragm type. Rack and pinion steering guides the car and the wheels are of the centre-point design, meaning the turn-in is sharp and direct. The steering has 2.2 turns lock to lock. Of course, we must explain the suspension for those nurtured on conventional systems. Unlike steel sprung cars, some of which such as Lancia, Renault and Rover are very acceptable, the CX has a development of the concept deployed to acclaim on the DS. Each wheel is fitted with a shock-absorbing sphere in which mineral oil interacts with a constant mass of gas. The hydraulic system also serves the steering and brakes. Anti-dive geometry minimises nose lift and dipping under hard driving, which this assured and balanced car encourages. Among the advantages of this arrangement are that the suspension clearance is adjustable and so the car’s height off the ground can be raised at the touch of a lever. This means it can negotiate rutted roads without the underbody catching on bumps and protrusions. Sitting inside the car, the driver is greeted by a novel and logical set of controls. The indicators are located on the instrument pod and one simply dabs a rocker switch left or right to inform others of one’s intentions. This is of no use in Paris, of course. The speedometer is set on a rotating drum giving precise information on road speed at any and at all times. The ventilation controls are set between the driver and passenger on the centre console (why did nobody think of this before?) and the steering wheel has but one spoke. One sits snugly as in a sporting saloon and the view out all around is superb. 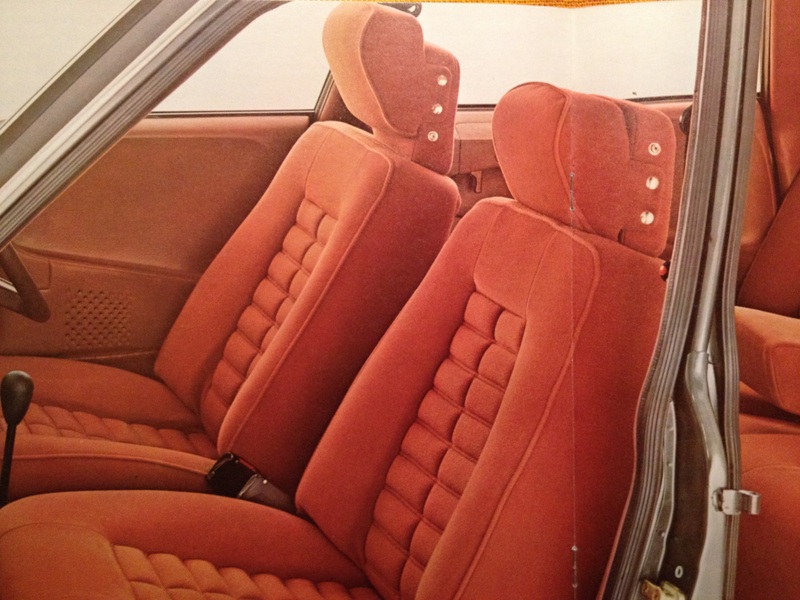 Fine upholstery in the 1974 Citroen CX 2200 (Pallas shown). Rear passengers are treated to a pair of low-set bucket style seats. This is no Vauxhall or Volvo with their flat benches that allow one to slide from port to starboard as one ponderously negotiates a roundabout! Citroen have selected a comfortable cloth available in a set of striking colours too. Ladies will like this car’s cheerful interior! Though the car looks like a hatchback, Citroen have designed it as a saloon with a separate boot enclosing 16.8 cubic feet. There is plenty of room for luggage and if you choose to load up with some crates of wine, the self-levelling suspension means the nose always points horizontally. To evaluate this car we took it from Paris eastwards as far as we could go, to test its limits and find those of modern Europe. We set off from Citroen’s drab headquarters with the photographer Land-Windermere safely asleep in the back of the car and his equipment, a single Kodak Retinette camera and one roll of film in the boot. On the autoroute out of Paris we endured rain and traffic delays as far as somewhere near Chateau Thierry. The CX’s superb chairs and quiet, torquey motor meant all I had to do was work through the Craven “A”s at my leisure as we trickled east. The conditions required a lot of stirring of the gearbox but this was no chore as the four-speed box’s changes are as precise as the steering. Under the car the bumps and thumps stayed distant and muffled, as if we were driving on newly laid tarmac set on a foundation as smooth as a billiard table. The engine pulled strongly in all gears but was relaxed at cruising. Dinner at Reims: a fine onglet with onion sauce and a bottle of Bonnezeaux refreshed me. And on we pressed after a short cigar in the carpark. As the roads eased up I was able to stay at a comfortable cruising speed of about 90 mph. At Reims we turned south-east and passed Verdun and Metz and onto Saar-Brucken. It’s very grey. The west German roads are noticeably worse than those in France and some are paved with concrete. The hydropneumatic suspension dealt with these with utter disdain. Land-Windermere didn’t stir until a very late meal at a Gasthof somewhere around Homburg. We had a Prussian dish of meatballs in a caper sauce. Jolly nice and very much my cup of tea. The Germans do eat well, I say. Our plan was to drive as far as possible, on as many types of road as possible and to see where Western Europe ends and after eight or nine hours we had found out most of what was to be discovered. Due to a misreading of the map and Germany’s rather unhelpful Autobahn signs, we plunged north after a fight with a complex Autobahn intersection and didn’t get our bearings until a kind chap somewhere around Frankfurt explained things to us at a petrol station. The CX, by the way, returned about 26 mpg. Deciding to improvise, I carried on in this vein for a few more hours. 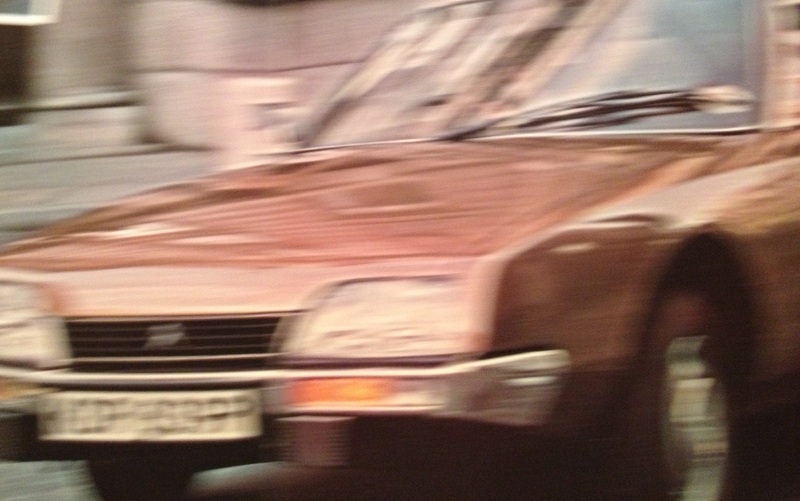 For a hundred miles I took secondary roads and the CX demonstrated sure footed handling. There was the inevitable understeer of a front-driver but it was measured and predictable. The breakaway was well signalled and the car’s fine balance meant it never got very alarming. The steering does not reveal very much about the road’s surface but it also meant one was relieved of tiring jostling and juddering which ordinary cars force upon their drivers. Citroen have cleverly set the vehicle up so that one only feels what one needs to feel. Noise is eliminated and thus the driver can concentrate on what is important, finding out where precisely one was in this case. It was rather dark and very, very late when we approached the end of our journey. The Citroen had covered about 500 miles on a wide variety of roads and proved itself a remarkable companion, more than can be said of Land-Windermere who only took the barest few photographs when occasionally he emerged from dreamland. Somewhere west of Bad Hersfeld I took a wrong turn and ended up navigating a tricky and muddy forest road. The CX coped remarkably and this allowed me to do the final check, seeing how it rode when the suspension was raised. It was impossible to turn back due to the narrowness of the track and the deep ditches on either side so I carried on hoping to find a junction or to exit the forest. After about ten miles of dark, arboreal confusion I had some vague insight into how the Roman legionaries must have felt when trying to subjugate the ancient German tribes. The wet, endless and dark forests of those times must have been worrying, especially when, at any moment, a tribe of Germans would spring out of the mulch and set upon the invaders. What appeared to be a helpful flashlight and a man waving energetically at me raised my hopes. I pulled up at a check point and realised I had somehow wriggled across the border between East and West. “Which way is East Germany, please,” I asked. “And is there a Gasthof near here?” I added. To cut a long and diplomatically difficult story short, the East German guards were not at all happy with the situation. Guns were pointed, though mostly at the car. They inspected my passport and disturbed Land-Windermere for his. We waited for a while in the car’s warm and cosy interior before being invited – shall we say – to leave the Citroen and to walk some hundred feet onward. I was asked in broken English to surrender the keys. Land-Windermere luckily had his camera in his duffel coat but I lost four packs of cigarettes to one soldier. The car remained where we left it but I don’t suppose the east Germans would know how to work it as they are still accustomed to two-stroke, wheeled card-board boxes. Our feet got very wet. We hitched in a tractor to a village where no-one spoke English. In summary, then the CX provides a startlingly intelligent set of solutions to modern motoring problems. It continues the bold path set by the DS and makes clear advances in all areas. To get back to Paris we rented a Mercedes 200 (eventually) and thus had a good opportunity to compare the saloon car’s future with its distant past. If even Mercedes-Benz can’t beat the standard set by Citroen, what hope Ford, Vauxhall and Austin?